This exquisite piece of Babe Magnetizement was found at LoserCars. Can’t be sure of the make or model, but it appears to be a 1955 Chevy V-6 with the genitalia removed, and fiberglassage slathered all over it to make it appear to be a 1957 Chevy V-8 with the genitalia removed and a big ‘ol honkin’ Eyeball ‘O Death on the front of the dorsal fin. Pure efficient genius. Kinda suggests what kinda talent the Mendocino Volunteer Fire Department has. So which one is the true Babe Magnet? AND FOR GOD’S SAKE DO NOT POST ANY COMMENTS. 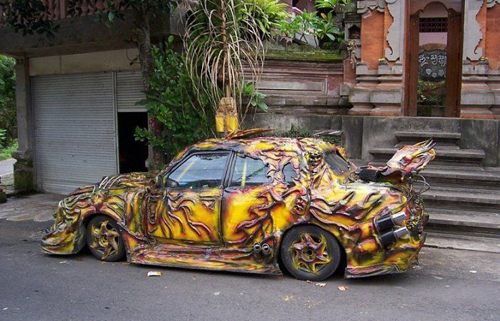 This entry was posted on Sunday, 13 April 2008 at 12:05 AM and is filed under Automotive, Babe Magnet, Bizarre, Cool, Humor, Odd, Retro, Stupid. You can follow any responses to this entry through the RSS 2.0 feed. You can leave a response, or trackback from your own site. Was that reverse psychology? Car #2!